We help to improve the performance, quality, efficiency and safety of the built environment through collaborative working. Advanced Solutions International, Inc is specified as the websites creator. 10. Work for us /CIRIA/About/Work_for_us/About/Work_for_us.aspx?hkey=88c6707a-757.. 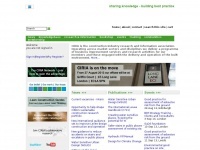 In total 4 links were found which refer to Ciria.org. Individual words like C656, CIRIA and Click are frequently used in text links from other websites. The most important link sources for this website are Limitstate.com and Buildoffsite.com. The sites /service/bookshop/core/orders/product.aspx?prodid=142 and /SERVICE/Home/core/orders/product.aspx?catid=11∏id=1748 are frequently referenced by external sources. The table shows the most important links to Ciria.org. The table is sorted in descending order by importance. The table shows websites of Ciria.org, which are often linked by other websites and therefore they are classified as important content. three profiles were found for Ciria.org in social networks. Among other social networks the website is represented in Twitter, LinkedIn and YouTube. The web server used by Ciria.org is run by MDNX Enterprise Services Limited and located in Great Britain. The website Ciria.org has a own web server. The web server only runs this website. The websites of Ciria.org are served by a Microsoft-IIS server. The content management system DotNetNuke is used. The HTML pages were created with the latest standard HTML 5. The website does not specify details about the inclusion of its content in search engines. For this reason the content will be included by search engines.